Devotion to the Immaculate Heart of Mary is at the very core of the Fatima message. The Blessed Mother presented it as the solution to the problems of the world and to save souls from going to Hell. At the third apparition, in July 1917, after the terrible vision of Hell, Our Lady presented devotion to her Immaculate Heart, together with the Communion of Reparation of the First Five Saturdays and the consecration of Russia, as the means to avoid the perdition of souls, the chastisement of a new world war and the expansion of communism. At an earlier apparition in June, Our Lady had told Lucia, “Jesus … wants to establish devotion to my Immaculate Heart in the world. To those who accept it, I promise salvation and those souls will be loved by God as flowers I have placed to embellish His Throne. What is the meaning of this devotion? 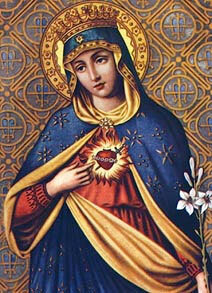 Why should we venerate the Immaculate Heart of Mary? Given our limited space, we will detail a few aspects, rich in meaning, of this admirable devotion. From time immemorial the heart has symbolized love, the most noble of all sentiments. In relation to the Sacred Heart of Jesus and the Immaculate Heart of Mary, it represents the Savior’s redeeming love to the point of delivering Himself for us and the co-redeeming love of Mary Most Holy that is united intimately with her Divine Son’s sacrifice. Thus, the object of devotion to the Sacred Hearts is His merciful love. This is why Pope Pius XII affirmed the devotion to the Sacred Heart of Jesus — it is fundamental. Based on his argument, theologians say the same about the Immaculate Heart of Mary: it is well understood and it is the essence of all devotion to the Blessed Mother. In addition to their specific functions, the parts of the human body serve to symbolize an aspect of a person’s most salient characteristics. Thus, a perspicacious person is said to have “eagle eyes” and a very courageous man has “a lion’s heart.” The same happens with devotion to the Sacred Heart of Jesus and the Immaculate Heart of Mary: it emphasizes a body part to symbolize a salient aspect of the whole adorable Person of Jesus Christ and the venerable Person of His Most Holy Mother, which is their merciful love. Devotion to these Hearts addresses therefore to the Persons of Jesus and of Mary. The absence of any sin in a creature implies a most abundant help of grace, which would not be possible without the extraordinary help from God. This is why the Angel Gabriel greeted Mary as being “full of grace.” Likewise, the absence of all sin implies a high degree of perfection and sanctity. Therefore, the Immaculate Heart of Mary symbolizes the hallowed purity and sanctity of Mary Most Holy and her complete fidelity to God. What were the feelings of Mary’s heart upon hearing the words of Simeon? They are easily guessed: her admiration and joy before the manifestation of her Son suddenly turns into bitter sorrow. The words, not only about the future of her Son but her own, were clear and definitive. But the entire and definitive fulfillment of Simeon’s announcement would be realized on Calvary … There, as nowhere else, Christ crucified would be a sign of contradiction … At the foot of the cross, His Mother would feel the announced sword in all the fibers of her motherly heart. Mary Most Holy is the Mother of the Incarnate Wisdom, Jesus Christ, and for this reason she is venerated as the Seat of Wisdom. Her Immaculate Heart also is, therefore, a Wise Heart, and Catholic liturgy has applied to her, since the 8th century, texts from the Sapiential books of Scripture. This sapiential aspect is emphasized in the two references that Saint Luke makes to the Heart of Mary. “Heart” here is a symbol of Our Lady’s interior life and of her continuous contemplation of God’s marvels, particularly as manifested in her Divine Son. The first reference is to the scene of the shepherds visiting the newborn Savior. Saint Luke comments, “But Mary kept all these words, pondering them in her heart” (Luke 2:19). The second reference is about the loss and finding of the Child Jesus in the Temple. Saint Luke repeats the same comment, with a slight difference, maintaining the same sense, “And his mother kept all these words in her heart” (Luke 2:51). It would be impossible in a short article to cover all aspects of the Immaculate Heart. But one cannot fail to recall that it is a motherly Heart filled with the tenderness that the best of all mothers had for the best of all sons. This tenderness is reflected in the love, full of mercy, that she has for us; which is why we invoke her as Mater Misericordiae. We find ourselves today in a time when sentiment is dying and relationships between persons are increasingly dominated by brutality, cynicism, self-interest and sensuality. Just think of abortion! Is this not the most cruel and brutal suppression of the most noble of all affections, which is motherly love? Isn’t this love often shortchanged by the attachment for a professional career or a transitory promiscuous relationship? Isn’t something similar happening to fatherly love? Isn’t this tragic egoism that destroys family relationships, and thus the family itself, spreading to all other types of human relationships? Thus one understands the Blessed Mother’s 1917 prophetic wisdom in Fatima when men would witness the death of sentiment.